Constitutional think-tank statement on the impact of Marikana. 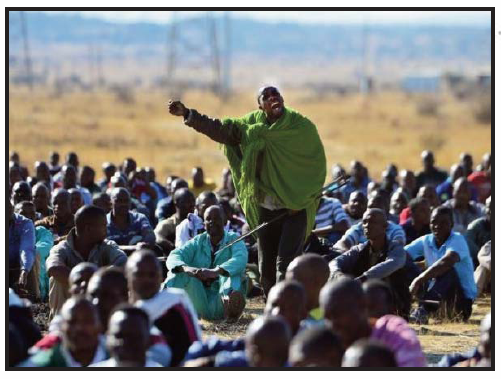 We believe that Marikana represents a turning point in South Africa’s post-apartheid history. The question is: in what direction will we now go? The serious violations of fundamental constitutional rights that the Farlam Commission must investigate with regard to Marikana are, in fact, a common reality for far too many people who live in South Africa. The credibility and legitimacy of the police is in tatters. The needless death of Andries Tatane last year was a grave warning of the dangers of the militarisation of the police force and the inadequacy of its public order management capacity. Zones of illegality, painfully reminiscent of our repressive past, blot the landscape. As a result, civil liberties are now imperiled, as the apparent collapse of the intelligence services and the partisan political use of state security forces render the country vulnerable to destabilization undermining our future prospects and prosperity, and which, more than anything, hurts the poorest members of our society the hardest. The state of emergency, in deed if not in law, that has been in existence in the aftermath of the Marikana massacre demonstrates the duplicitous role of the government and its security forces. A repressive clampdown with the rule of law seemingly suspended has engulfed the communities grappling with the trauma and grief of the massacre. The basis on which the police conducted search and seizure operations in the early hours of Saturday 15 September remains unclear; on the same day rubber bullets were again used resulting in the death of ANC Councillor, Pauline Masulo; marches organised by the Women of Marikana have been banned; individuals have been prevented from addressing meetings of workers for no apparent good legal reason; and there have been numerous arrests of workers in other platinum mines in recent weeks ñ these are all occurrences associated with the repressive apartheid regime in the 1980s. Now is the time to draw a line in the sand and to demand a renewed commitment to the Constitution, its progressive vision of socio-economic transformation, and its principled commitment to the rule of law. We submit that Marikana cannot be examined in isolation of the socio-economic and political context in which it occurred ñ a context in which a dangerous culture of intolerance and political violence has persisted, and in which the ability to process peaceful dialogue and to mediate industrial relations has been lost. The system of collective bargaining established by the 1995 Labour Relations Act has also been dangerously undermined. Rightly, the Commissionís Terms of Reference require it to consider corporate responsibility. The imperative of creating new decent jobs, with a living wage, has to be a shared social obligation. Thus must we all reflect candidly on the causes of this crisis, recognising its various components, which include: structural weaknesses in State institutions that have permitted a culture of impunity in the use of State power to grow; acute failure of leadership in both government and in the ANC; deep rifts in and between trade unions; unacceptable levels of wage inequality; the root causes of chronic poverty and long-term unemployment. constitutional norms cannot countenance the persistent violence and sense of lawlessness that characterises many public gatherings, strikes and protests. We appeal to all people to exercise the right of assembly without bearing arms and weapons of any kind, and to desist from engaging in acts of violence and intimidation. We must also acknowledge the fact that the ANC’s looming national elective congress is contributing to the heightened levels of intolerance and conflict as factions within the ANC jostle for power. There is a conservative trajectory within elements in the ruling party that betrays the noble objectives of the liberation struggle, and which threatens the idea of progressive constitutionalism that was at the heart of the post-1994 social compact. The ANC’s Mangaung Conference will likely determine whether that trajectory is hastened or rejected. In short, progressive politics are under threat. Progressive organisations and movements must inject new energy and commitment into their efforts to protect our constitutional order, and must commit to work together to pursue rights and secure human dignity. As the Farlam Commission begins its work in earnest, it must mark the start not only of an open process of unrelenting, unconditional search for the truth about what happened on 16 August, and why, but also a new chapter in our collective resolve to build a society that reflects the vision of our Constitution. It is an opportunity that must be grasped. The government must do everything possible to ensure that the Commission can do its work, with full access to all relevant information, as well as to all role-players and decision-makers within both the police and the wider security establishment. Any suggestion that evidence is being suppressed or bad decision-making covered up will do untold harm not just to the search for accountability and justice, but to the families of the victims of Marikana. appropriate support, whether in the form of provision of transport and accommodation so that they might attend the hearings, or in the form of ensuring effective legal representation, and extending to offering counselling for the tragedy they have suffered. The barbarity and violence of 16 August must be replaced by civility and a newfound respect for human life.